Installation art can be risky. It’s just that usually the risks are more about whether the pieece will work and whether viewers will respond as one hopes rather than whether they’ll stumble on a floor of broken glass. 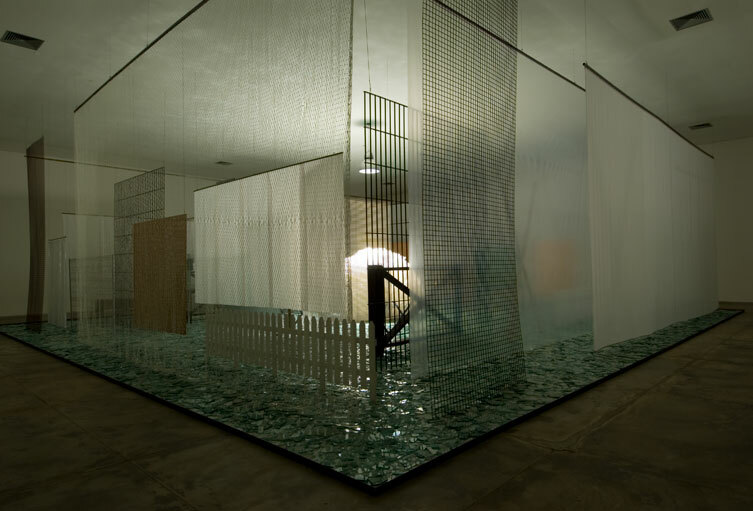 But having risked his own freedom by making overtly political work while living in a military dictatorship, Cildo Meireles was never likely to be put off by something like a slight – and largely theoretical – risk of an audience member sustaining a minor injury. Unlike the harmless threat of the long shadows and caged-in feeling of being in a Mona Hatoum installation, Meireles’s Through does involve a level danger, albeit a low one. Through is a labyrinth, albeit a transparent one. To reach the centre, it’s necessary to navigate one’s way through a plethora of barriers. At every turn, there is a new fence to circumvent, in places tropical fish swim in tanks. The barriers are mostly familiar and not inherently threatening. The floor is quite another matter and it is this that gives the installation its sense of menace. Walking on broken and, more alarmingly, breaking glass is disconcerting to say the least. 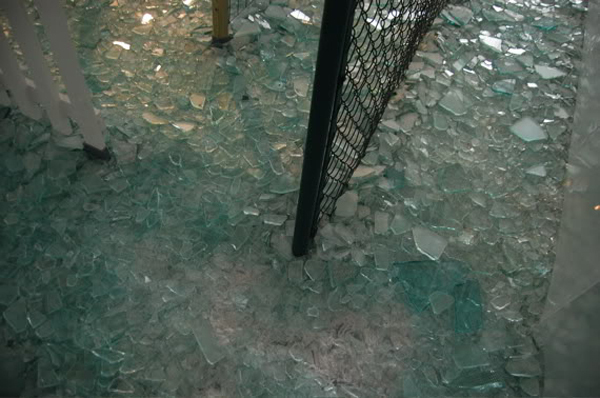 The sound of glass cracking underfoot isn’t pleasant. On a visit to Cildo Meireles’s exhibition at Tate Modern in 2008, though treading carefully – or perhaps by being so self-consciously cautious – I found myself almost tripping at one point, an alarming sensation in a museum even if I hadn’t been walking on such a hazardous surface. The heart of the installation is a giant ball of cellophane, brightly lit from above so that it seems to glow in the space. Though beautiful and given status by its position and the lighting, this is effectively a much larger scale version of packaging we might scrunch up – making much the same sound as the glass cracking underfoot here – and discard. There are various possible interpretations of Though from the degree to which we feel the need to protect ourselves by building barriers to the way we are controlled in public places. Ultimately though what I found most compelling about it was the strangeness of the experience and the genuine sense of risk. 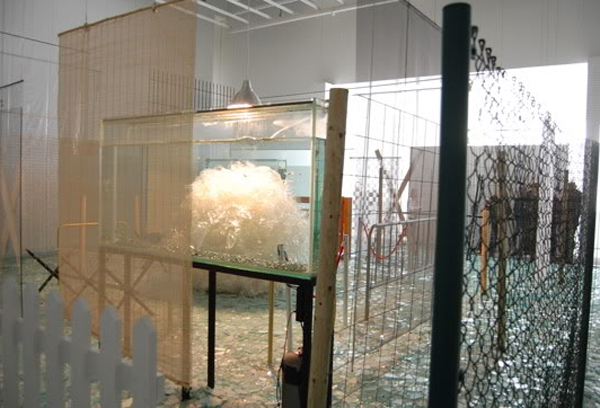 This entry was posted in Installation and tagged art, barrier, broken glass, Cildo Meireles, installation, sculpture, Through by Ann Jones. Bookmark the permalink.